Our weekly mowing visits include mowing, trimming around all fence lines, swing sets, houses, etc, blade edging as needed and blowing off all debris from the sidewalks, driveways and patio areas. We use top of the line Walker Mowers to bag your grass clippings to maintain a neat and clean appearance. Are you tired of all the dandelions? We are here to help. Let us help you customize a fertilization and weed control program to give you the healthiest, greenest lawn in the neighborhood. 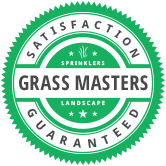 Grass Masters can help you with your sprinkler system maintenance. We know how confusing sprinkler timer programming can be so we’re here to help you with setting up your sprinkler controllers as well as setting up your watering schedules. You may have wondered if you should be aerating your lawn? There are an unlimited number of reasons why you want to aerate your lawn. Over time your soil naturally becomes compacted, leaving the underlying soil undesirable for healthy lawn growth. Walking, playing, mowing, and watering compact particles and reduce the air space necessary for root growth. Has spring arrived only to find that your lawn has been matted down from all the snow lying on your lawn or are you seeing snow mold? Let our team come and help you get your lawn cleaned up and ready for spring. One of the best ways to take care of your lawn and help it to thrive and remain green, is to make sure that it has been prepared for the changing of the seasons with a good Spring or Fall Cleanup. Make your holidays sparkle with Christmas light design and installation that will add a festive touch to your home this Christmas Season. From classic white lights to colored lights, our design services will help you select the right fit for your home. Find the information you need? Then fill out our Free Estimate form and one of our experts will contact you to discuss your landscape needs. Still have questions? Feel free to Contact Us. We are always happy to answer any concerns you may have. For Fastest Service, give us a call at 435-752-5890.